The Intan is an iconic museum in Singapore, and a unique cultural attraction in the region. This museum, whose name translates to ‘My Rose Cut Diamond’, is a stunning collection of antiques that best reflect the Peranakan culture. 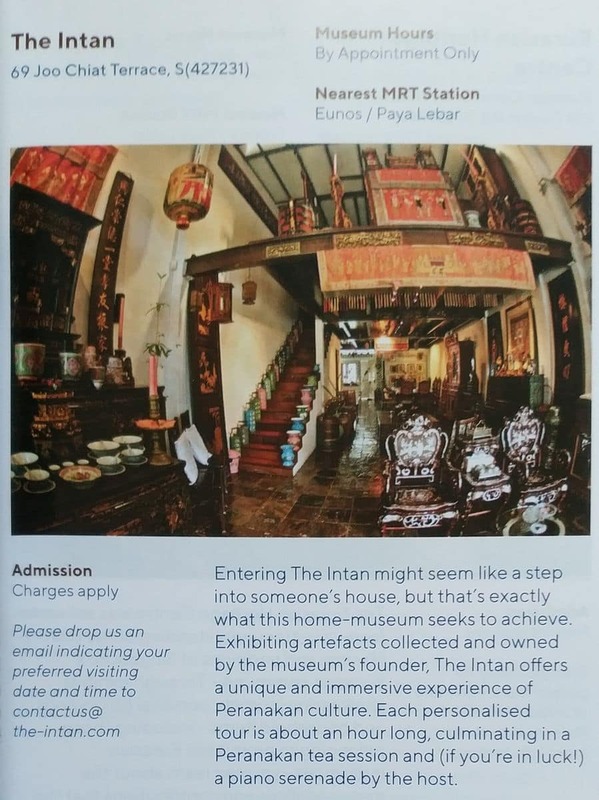 The museum is a haven for treasures of this remarkable culture, and a tour of the Intan gives visitors a chance to walk back in time and marvel at the spirit of the Peranakan people. On arrival at the museum, the first thing that strikes you is how unassuming the exteriors of the house are. It is not until you walk inside that you get to marvel at the astounding collection of antiques that attempts to combine the charm of the past within the contemporary setting. The open layout and the mirrors create the aura of a spacious indoors, and within it, the sheer diversity of collectables from years gone by. From rows of beaded traditional slippers with intricate designs, to vibrantly coloured costumes, jewellery pieces and an array of trinkets, there is no shortage of traditional aspects to learn about in this culture. It is fascinating to note that, unlike your typical museum where information cards abound, The Intan has no cards at all. Ask Alvin Yapp, the museum’s owner, anything about the different collections and he will gladly indulge you. A tour of this museum is incomplete without enjoying tea or dinner the Peranakan way. Needless to say, this is a favourite for many visitors as it is an opportune moment to sample traditional snacks and meals dotingly prepared by Mr. Yapp’s mother. Best of all, the meals are served in charming crockery for a holistic Peranakan experience. Depending on the time of your visit, you may listen in to Yapp and a few of his family members belt out a local song or two. The Intan is open by appointment only, so bookings must be made in advance to ensure slots are available. Custom made packages are also available for private events as long as they are related to the Peranakan culture. Visitors should note that visits are strictly by appointment only.